It was around this point in time that Morning decided it was time to quit his job at B of A. The truth of the matter was that he had elevated his game as much as he could, considering his limited availability. Since he was still living at home with his parents he was sure to have a roof over his head. It was a decision his ex-mentor Donny supported. Focusing solely on the work ahead was the next logical step in his journey, the culmination of the passion and work he’d invested thus far. In just the past year Morning has worked with numerous players in hip hop, pop, and R&B. He recorded artist Jessie J for her highly-anticipated upcoming album, produced by Camper (Mary J. Blige, H.E.R.). Connecting with producer Hitboy (Beyoncé, Rihanna, Jay-Z, Kanye West), Morning recorded and mixed multiple songs for Good for You by artist Aminé. Working with producer Frank Dukes (Jay-Z, Drake, Frank Ocean), Morning also recorded the chart-climbing album single “Never Be the Same,” on former Fifth Harmony member Camila Cabello’s debut studio album, Camila. 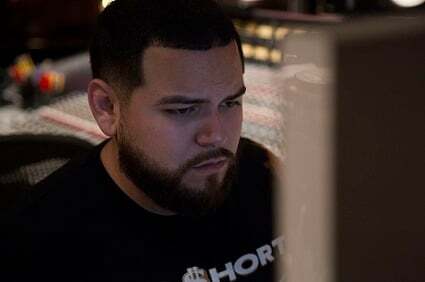 Other artists he’s worked with include Nelly, 50 Cent, Tech N9NE, Linzi Jai, Marsha Ambrosius, Noah Cyrus, Mr. Porter, and more! So what advice does Morning have for current Recording Connection students?